This is a snapshot of my life in Vietnam from 2004 – 2006. Things have changed tremendously and I miss those years a lot. I thought I would post this video and add some information for anyone thinking of exploring Vietnam. :18 – We met some very friendly shop keepers and their super cute baby. If you look at the expression on the mothers face she frowns a bit. This is because our “guide” tried to say a word in their native language (not Vietnamese) but messed up the pronunciation. :43 – This is at Cao Dai . They have their own religion which focuses around the all seeing eye . :50 – We were invited to a festival and the young lady in blue is a member of the communist party. She was very friendly and an excellent host. :54 – The way to get around Saigon is by motorbike. To get to the other side of the street you have to pass right through the traffic. The best way to explain how is like a school of fish. You honk your horn repeatedly and the mass will swarm past you just like a school of fish would. It’s really not difficult to do. People on foot cross the street this way and the trick is to just walk very slowly and steadily. Don’t make any sudden movements! 1:30 – This is “round-a-bout” Again, like a school of fish, if a larger group is coming you stop and let them go first. I was the last to pass by before another mass of cars/motorbikes joined in and took a bit of a risk here. 1:59 – I give a kiss to Claudia. She is a Viet Kieu which means a “returning Vietnamese.” During the war so many left but now are returning for vacation or to live but all to discover a bit more about their home country. It’s so amazing because these people relocated all over the world. Some speak German, some French, some English, basically they are coming from everywhere. 2:11 – Back in Dalat and a really cute baby is loving the music. It’s when you see like things like this that you really start to detest war. 2:17 – On the “party boat” in Nha Trang. This ride is completely awesome. We always drank beer, then snorkeled, then did jumps off the boat. They also create a “floating bar,” in which a crew member goes out in an intertube with a lot of bottles of TERRIBLE wine from Dalat. We didn’t care that the wine is awful because we were pretty drunk anyway. I remember speaking with a Viet Kieu from France and it was her first time back to Vietnam since she left as a baby. Just so amazing to meet those people. 2:31 – We were invited to the house of a gentleman who was an officer in the North Vietnamese army. We drank and had fun communicating through our translators. Again, war is stupid, people are people and everyone just wants to enjoy life, no matter what side you are on. 2:36 – In the jungle in a creek. This is Mui Ne , a very beautiful beach side resort with amazing sand dunes. 2:37 – We met a bunch of kids who were very interested in us. We bought them all coke and played a few games with them. 2:45 – This is Octoberfest which is a HUGE party at one of the hotels. Basically, you drink beer, eat German food and drink some more beer. 2:57 – We were at the St. Andrews Ball. 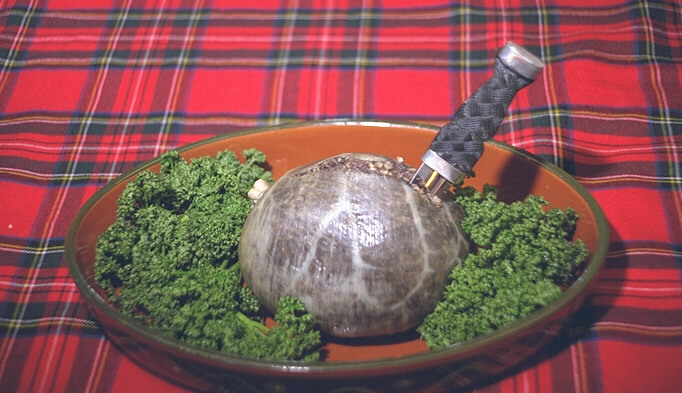 They even cut the haggis !! This ball is the most exclusive in Saigon and a ticket runs about $100 US Dollars. 3:08 – Myself in front of Ben Than market. This is popular with the tourists but frankly, there are other markets further out with better prices. They would always ask my wife “O’ne-san, O’ne-san, nani hoshi? ?” — Big Sister, Big Sister, what are you looking for? 3:13 – Cu Chi Tunnels – These are the famous tunnels which the American Army unsuspectingly build a military base right on top of. Now, it is full of tourists. In the past, you were allowed to shoot kalashnikov rifles for a dollar a bullet but it was discontinued because a Korean committed suicide there. Not sure if they allow this now since it was quite a while ago. 3:36 – Darts! Most bars in Saigon have their own darts team. I was the captain of mine and the team members belonged to companies such as BP, Conoco-Philips, Canadian Consulate, American Consulate. We also were at the top of the league for a while. 3:56 – A beautiful sunset. I really love Vietnam and hope that one day I’ll be reconnected with that country.